NOTE: Items on this page may need new refill cartridges in order to write. We do not sell ballpoint or rollerball refills. Refills for some older pens may no longer be manufactured, though newer refills can often be adapted. 9865: Eversharp Star Reporter ballpoints: 12 new old stock ballpoints, 13.25 cm long, gold filled trim, various colors, in original factory shipping tray. Nonfunctional, as they lack refills; for use with current-production refills, adaptors will be necessary. Retailed at $1 each from the late 1940s to the early 1950s. 13884: Geha Hermetic ballpoint demonstrator in box: transparent plastic, 12.9 cm long, gold plated trim, not sold to the public; made in Germany, with instructions. 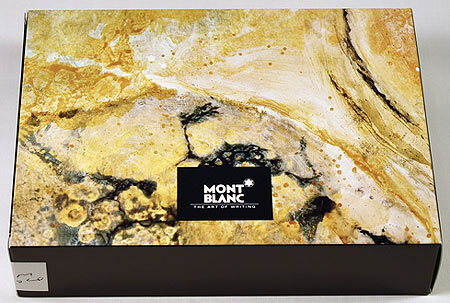 12693: Montblanc 75th Anniversary 161 ballpoint in box: hard to find limited edition, very low number 83 of only 1924 pieces, rose gold trim, inlaid diamond above clip, mother of pearl star; condition perfect, but in a regular Montblanc box, not original limited edition packaging. 12747: Montblanc Alexandre Dumas set: complete three-piece limited edition ensemble with matching serial numbers, fountain pen, ballpoint, and mechanical pencil; only 5000 sets made, plus this is the first version with the wrong signature (the son's rather than the father's) which was recalled, making it doubly scarce. Perfect unused condition, but no boxes or papers. 13194: Parker 180 Ms. Parker rollerball: brushed stainless steel with gold plated trim, bold barrel band with roped edges, 13.1 cm long, designed by Emilio Pucci. Made in USA, takes standard Parker refills; as new, with original leatherette case but no other packaging. 13195: Parker 180 Ms. Parker rollerball: brushed stainless steel with gold plated trim, bold barrel band with roped edges, 13.1 cm long, designed by Emilio Pucci. Made in USA, takes standard Parker refills; with original leatherette case. 13192: Parker 180 Ms. Parker rollerball: brushed stainless steel with gold plated trim, bold barrel band with roped edges, 13.1 cm long, date code "QC", designed by Emilio Pucci. Made in USA, takes standard Parker refills; as new, with original leatherette case but no other packaging. 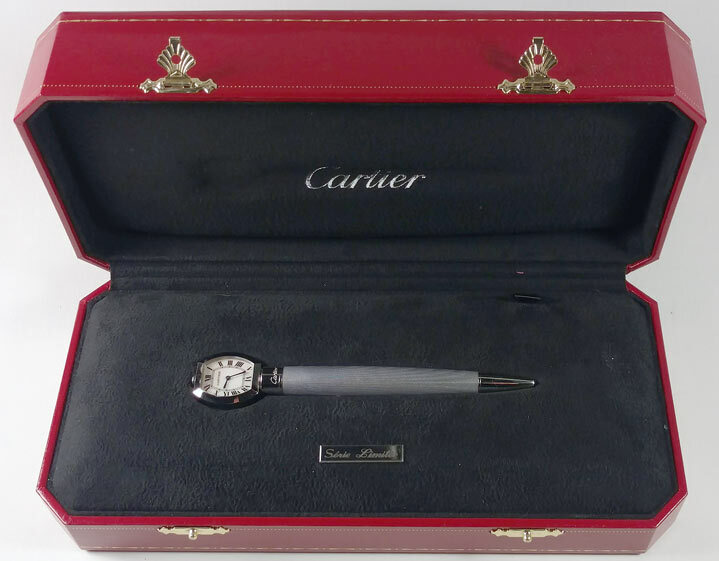 13257: Parker 75 Ambassador ballpoint in box: sterling silver, chrome plated trim, dished ends, cap actuated; an uncommon and highly desirable pattern. Instructions and guarantee dated 1978, new old stock, inner and outer boxes, some damage to outer box. 13853: Parker 75 ballpoint and pencil set: sterling silver grid pattern, gold plated trim, both cap-actuated, ballpen is USA production with "NL" date code, pencil is French with slightly earlier "TE" date code, basically a ballpen with a .5 mm lead converter; set comes with an earlier 1.0 mm lead pencil converter that can be used in the ballpen if desired. 7650: Parker 75 ballpoint manufacturing display: five pieces in sterling silver illustrating different stages of forming a cap, deep-drawing from sheet; the last stage is at final dimensions with the top hole cut, but before application of the imprints and engine turning; from Parker's Janesville factory. 13927: Parker Classic ballpoint: vermeil (gold-plated sterling silver) grid pattern, gold plated trim, button actuated, made in USA, marked "STERLING VERMEIL CAP & BARREL"; very clean, mellow toning. 5994: Parker Classic Imperial ballpoint: gold-plated, grouped parallel lines pattern, made in USA, new old stock, no box. 11213: Parker Classic Imperial ballpoint: grouped parallel lines pattern, marked "10K G.F. CAP & BARREL", enamel Motorola badge on clip, logo also inset in cap button; made in USA, new old stock, no packaging, minimal handling wear. 11228: Parker Classic Imperial ballpoint: grouped parallel lines pattern, marked "10K G.F. CAP & BARREL", Bank One enamel badge on clip, bank name etched on side of cap; "IIE" date code, made in USA. 13707: Parker Classic Imperial ballpoint set in box: gold plated ballpoint and twist-action pencil, made in USA, grouped parallel lines pattern, pencil uses standard .9 mm lead; appears unused, as new, marks to box. 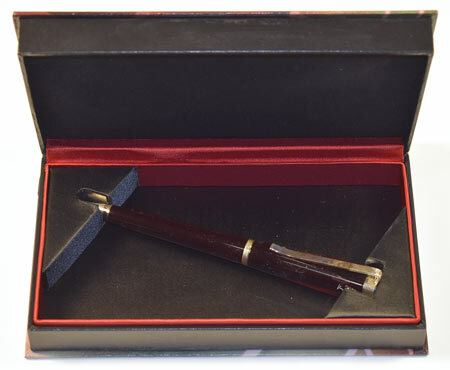 12825: Parker Duofold Centennial set in box: early production set in black, made in UK; fountain pen has "IN" date code, ballpoint has "IE"; pen has been dip-tested. Packaging is later, for a different Duofold model. 13871: Parker Jotter demonstrator: transparent ballpoint, brushed stainless steel cap, gold plated trim, made in USA, "Y" date code, uses standard Parker refills, stress line at front of barrel does not affect function. 13657: Parker T-1 ballpoint with injector pencil cartridge: brushed titanium, gold plated trim, red clip jewel; uses standard Parker ballpoint refills, or can be used as a pencil with the included 1.0 mm converter cartridge; like new, only slightest signs of handling. 13656: Parker T-1 ballpoint with injector pencil cartridge: brushed titanium, gold plated trim, red clip jewel, original clip tag; uses standard Parker ballpoint refills, or can be used as a pencil with the included 1.0 mm converter cartridge; as new, no box or papers. 13658: Parker T-1 rollerball: dark grey matte-finish titanium, 13 cm long, gold plated trim, transparent red ends, takes standard Parker refills, like new. 12676: Pelikan 355 ballpoint: striped green pearl and black, 13.25 cm long, gold filled trim, excellent appearance but name removed from back of upper barrel (see detail). Uses Schneider Express 75 refills. 6964: Reynolds International ballpoint: aluminum, 14.5 cm long; not working, a relic of the beginnings of the postwar ballpoint craze; original price was $12.50 -- as much as the top-line fountain pens of the era. 11020: Reynolds International ballpoint: aluminum, main barrel finished in dark purple-blue; 14.6 cm long, not working, a relic of the beginnings of the postwar ballpoint craze; original price was $12.50 -- as much as the top-line fountain pens of the era. 6796: Reynolds Rocket ballpoint: aluminum with black anodized end, 12 cm long, aluminum sliding tip cover, Reynolds-marked chrome clip; tip ball missing, not in working condition. 6797: Reynolds Rocket ballpoint: aluminum with black anodized end, 12.3 cm long, clipless model, black plastic sliding tip cover; cartridge intact but dried out. 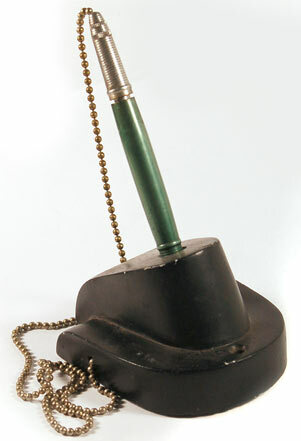 12209: Reynolds Rocket ballpoint desk set: rare institutional desk version of Reynolds' infamous pioneer ballpoint; pen is anodized aluminum, ball tip is intact, original refill has not been replaced, nonfunctional as is, chain attachment to black-finished cast zinc base, screw hole in front of base to allow permanent attachment to a counter or table. 13912: Rotring Tikk Kuli ballpoint demonstrator: transparent dealer-only version, 12.2 cm long, German made, thin wash plating to trim mostly worn off, but condition otherwise fine to excellent. 13968: Sheaffer PFM III demonstrator set: rare transparent dealer-only version of Sheaffer's oversize Snorkel-filler; 13.6 cm long, gold filled trim, White Dot, black nib-hood assembly is correct, one short stable stress line directly under the clip (see detail), sac and seals have not been replaced. Matching ballpoint has internal stress mark next to clip (see detail). 7806: Sheaffer Targa ballpoint: sterling silver, 13.3 cm long, gold plated trim, White Dot, twist-action to extend and retract tip; new old stock but without packaging; several available. 7780: Sheaffer Targa ballpoint: sterling silver, 13.3 cm long, chrome plated trim, White Dot, twist-action to extend and retract tip; new old stock but without packaging; several available. 13903: Tiffany ballpoint: solid 14K gold, bamboo pattern, 11.8 cm long with tip retracted, fully marked; a few shallow bumps to the front end, uses mid-length (87 mm) Waterman Titane-style refills, total weight 25.4 g, excellent quality and heft. 13904: Tiffany ballpoint: solid 14K gold, bamboo pattern, 12.7 cm long with tip retracted, fully marked; scattered dings to the front end, light pinprick marks to the top, uses full-length (95 mm) Waterman Titane-style refills, total weight 27.9 g, excellent quality and heft. 13905: Tiffany ballpoint: solid 14K gold, bamboo pattern, 12.7 cm long with tip retracted, fully marked; pinhead dings to ends, uses full-length (95 mm) Waterman Titane-style refills, total weight 26.8 g, excellent quality and heft. 12916: Towle ballpoint telephone dialer: sterling silver, 12.3 cm long, uses standard Schneider Express 75 refills, scattered bumps and marks, ball end bent to the side (see detail), very solidly made with good heft. 13812: Towle ballpoint telephone dialer: sterling silver, 12.3 cm long, uses standard Schneider Express 75 refills, scattered bumps and marks, ball end bent to the side (see detail), very solidly made with good heft. 13440: Waterman C/F liquid lead ballpoint: blue with brushed stainless steel cap, 13.4 cm long, gold plated clip, made in USA, twist-action point retraction; chalk marks on barrel, eraser under cap, original cartridge dried up, refills no longer available.